When the door closed behind Buffy and Riley, Spike threw his cigarette on the ground and got back in his car to go look for something else to kill. He was suddenly feeling the need to get into a fight that would last longer than the few fledglings he’d found and dusted earlier in the evening. After telling him she didn’t want to go out, Buffy’d obviously changed her mind for the soldier. Spike had checked the house earlier, planning to report to Buffy about his patrol, only to find it completely empty. Meaning Joyce wasn’t home. And now that their evening out was over, Riley was following Buffy into the house. Snarling, he peeled out from his parking spot, not caring if they heard him or not. True to her word, Dawn had gone to her room, so Buffy and Riley had the living room to themselves. Buffy turned on the TV and settled onto the couch. After a moment of hesitation, Riley sat beside her and put his arm across the back of the sofa. After a desultory perusal of the menu, Buffy settled on an old Bruce Lee film and put the remote down. With them both being martial arts experts, they soon found themselves enjoying the fight scenes and commenting on the various moves. “You think he should have beaten us?” Riley sounded offended and disbelieving. “No, it isn’t. But I did my ranting and crying about how unfair it all is years ago. Now I just concentrate on getting better at what I do and living as long as I can.” She turned back to the screen. “Oh look. Now there’s a move I haven’t seen yet.” She studied the fight going on intently while Riley studied her with newly aware eyes. “You really aren’t like anyone else,” he murmured. “And I don’t mean that just in a ‘you’re an amazing girl and I really like you kind of way’.” Buffy gave him a small smile before turning back to the screen. They were quiet until the credits rolled, then Riley stood up and stretched. “I don’t think it would be a good idea,” Buffy said. “We have to get back to the hospital first thing in the morning, and I’m going to try to get some sleep.” She walked toward the door with him. “Thanks for keeping me company.” Their goodnight kiss was perfunctory on both parts, something that left both Riley and Buffy frowning as the door closed between them. When Buffy had closed the door behind him, she walked to the kitchen, leaning on the counter and picturing her mother there, smiling and joking about Spike only that morning. Sudden fear clenched her body, and she shuddered. With no real idea why the night air might be soothing, just that she knew it would, she opened the back door and went outside to sit on the porch steps. She put her head on her knees and gave in to the emotions she’d been holding so tightly in check all night, sobbing quietly into her lap. A whisper of sound brought her head up in time to see Spike stalking toward her. His game face and furious expression died with the planned comment about her date with Riley as he saw the tears in her eyes. “Nothing.” She put her head back down so as not to give away the lie. Taking a deep breath, Buffy filled him in on where she’d been all night and why she was crying. By the time she finished, he was pacing the yard, swearing in several demon languages, and she was in control of herself again. “Too late,” he said with obvious delight. Spike was well on his way back to Restfield when he stopped to watch a woman in a tight red dress, gesturing to scabby-looking little creatures and shrieking at them. His vampire hearing was easily able to catch what she was screaming. Spike watched with interest as she shuddered all over and turned into a tall young man who seemed embarrassed, but not surprised, to find himself wearing a dress and high heels. Looking around quickly to see if anyone was watching, he met Spike’s eyes through the windshield. Spike drove closer and rolled down his window. The man nodded. “If you could just drop me near the hospital? I’ve got extra clothes there.” He climbed in, surprisingly unconcerned about getting into a stranger’s car in the middle of the night in Sunnydale. “I’m Ben,” he said as he stared out the window. Spike obeyed and Ben got out of the car and glanced around before running behind a dumpster. He emerged minutes later in medical scrubs and waved to Spike. Shaking his head, Spike drove away, but instead of going home he went to wake Giles up. When Spike’s incessant pounding had finally awakened Giles, he opened the door with a curse and a revolver in his hand. Spike blinked in surprise, then grinned. “This couldn’t wait till tomorrow?” Giles grumbled, even as he took out a pad and pen. He proceeded to instruct Giles to write down Glory’s name, that she was searching for a key of some sort, that she thought Buffy had it, and that she could turn into a human man named Ben, but that humans wouldn’t be able to remember seeing it happen. He checked that Giles had written everything down, including the instructions to keep writing it over and over. He added that Ben apparently worked at the hospital. “Which brings me to my main reason for being here... the hospital.” He quickly filled Giles in on Joyce’s condition and the evening’s events, leaving out his encounter with Riley. “Oh dear lord.” Giles leaned back in his chair. “Poor Buffy. Poor Joyce. Of course I’ll pick them up in the morning. 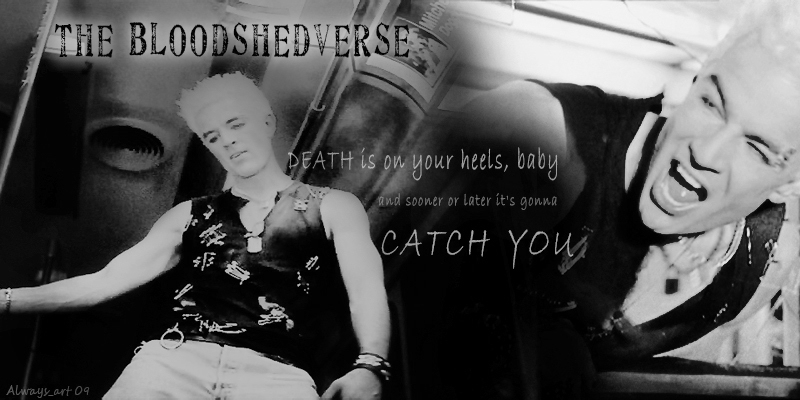 I’ll call Buffy first thing and tell her to wait for me.” He gazed at Spike. “If this Ben person and Glory are working together... what?” Spike rolled his eyes and pointed to the notes Giles had written down. Spike’s snarl startled him, but before Giles could remonstrate with him, Spike sighed and nodded. Spike stood up. “I might try to find one of those little scabby creatures and see if they know what this key looks like. Pretty sure they aren’t human, so getting information out of one of them might be fun.” He laughed at Giles’s shocked expression. “I am what I am, Watcher. The chip and my feelings for the Slayer aside, I’m still a demon, and I like demon things.” Giles shuddered, but nodded. “Very well. I will set the alarm and try to get a few more hours of sleep before I call Buffy. This is important information – I only hope I can remember to read it. I will talk to Willow about working on a counter spell. Perhaps a general spell to remove other spells will work.” He walked Spike to the door. “I suppose a thank you is in order,” he said. “Don’t hurt yourself, there, Rupert. Your smile is quite thanks enough.” With a laugh, Spike disappeared into the dark leaving Giles to close and lock the door behind him.